I’ve written a few posts on how stocks are fairly valued, or how you might be waiting forever for a crash. I’ve been derided as a wishful thinker, someone ignoring the reality of high P/E ratios and Fed easy money. First of all, there’s no way Fed policy could even be considered easy. No economic indicator shows an overheating economy, not even close. Second of all, I’m 37, so I still have more income to earn and invest than I’ve already stashed away. That means I’m hoping with all my heart for a crash, and for a long stretch of low P/E ratios. Why? Because even though I’d lose on my current investments, my future earnings would yield a lot more. Take a look at the scatter plot below. 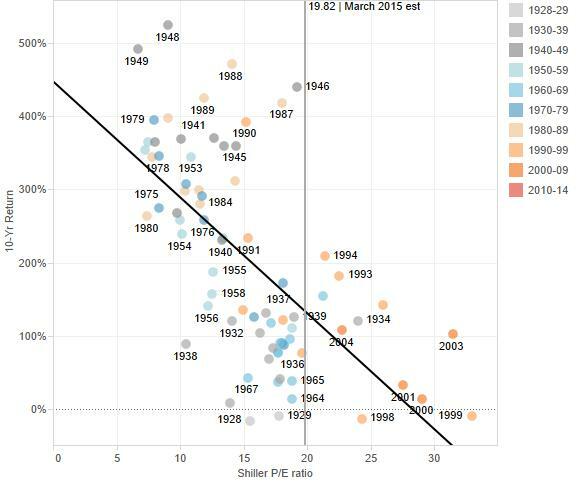 There’s a clear negative correlation: high P/E ratios mean lower 10-year returns. So if markets crashed to where they were in the 1930’s or 1950’s or the 1970’s, I could expect massive future returns. But is that likely to happen? Not really. Because when we look at the history of P/E ratios, or Earnings/Price as below (to give us earnings yield), we’re not looking at a bubble today so much as horrendous past economic policy. Yes, the 1930’s were a great time to invest, but it was also a terrible time for the overall economy. Deflation, depression, high unemployment and statism ravaged the American economy. The 1970’s as well looked like a high point for yields (and a low point for valuations). Again, terrible monetary policy was destroying the US economy with runaway inflation. Where are we now? Now we have stable prices, a tilt towards low inflation (between 0%-2%) and resultant low interest rates. 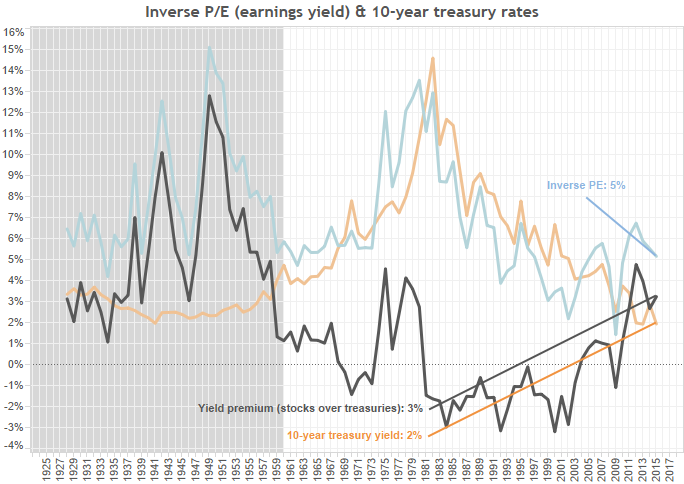 Thus the graph above shows a positive premium of stock earnings yield over 10-year treasuries. That means it’s still a great time to buy stocks. So even though I expect low future returns, I also expect monetary policy to get smarter, not dumber. And I also believe information about investment opportunities will continue to become more widespread. Armed with better information, more macroeconomic stability (stable, slightly-rising prices) and low interest rates, stocks won’t crash. And that’s very unfortunate for a generation of young investors who won’t get the nominal returns we have grown used to. But don’t fret. At least inflation won’t be quite the counterweight to returns it was in the past.